Classes are in session for the 2016 school year at our new high school at La Carreta with two of its wings finished. To construct the remaining wing, Somos Ohana Nicaragua is continuing our school construction campaign to raise the needed funds, around $53,000 more, USD. Please help us toward that goal. 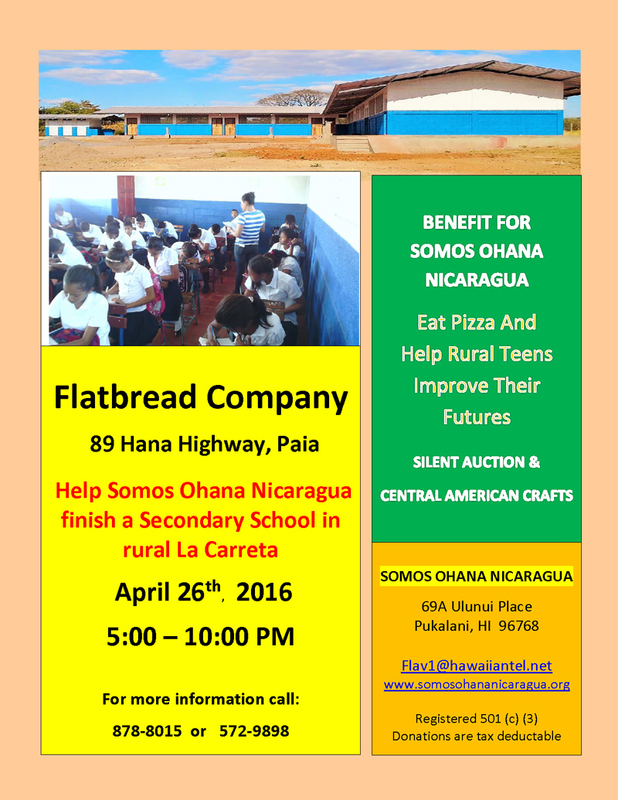 One way is to enjoy brick-oven pizza with us at The Flatbread Company of Paia, Maui, on Tuesday, April 26, 2016. A portion of every size of pizza purchased, including take-out, between 5:00 and 10:00 pm that evening will be donated to Somos Ohana Nicaragua. A silent auction of interesting and valuable items will also be happening. Muchisimas gracias to the generous owners and staff at Flatbread Paia for their solidarity and on-going, very generous support!